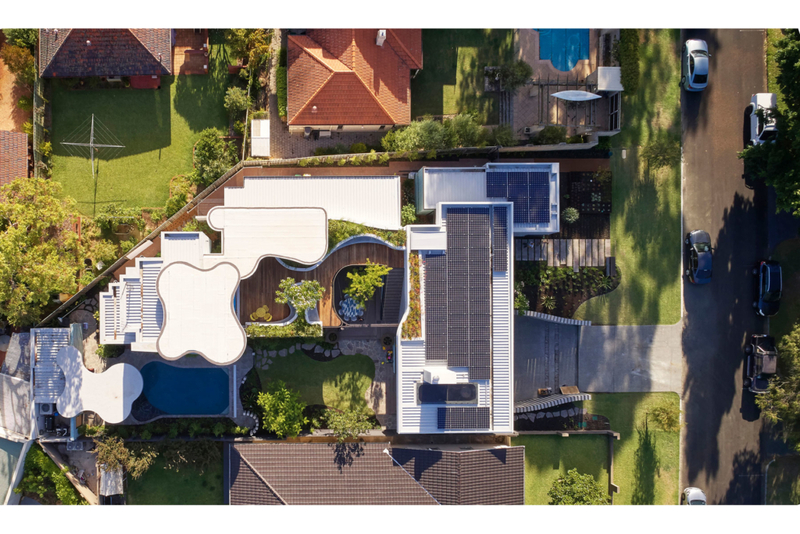 Roscommon House is a residential project in Floreat, Perth, referencing the suburbs modernist history with a largely board marked concrete residence. The brief of Roscommon House called for a house that would have a timeless and adaptable quality at the forefront. Versatility would ensure the house suited the family through changes in size and age, and provide a long lasting home. Another important characteristic was the profile to the street. It was important to maintain a graceful and unimposing facade, hence the decision to create a single storey front. A master bedroom arises from the back of the building, allowing privacy to the small second storey, along with a secluded roof garden. 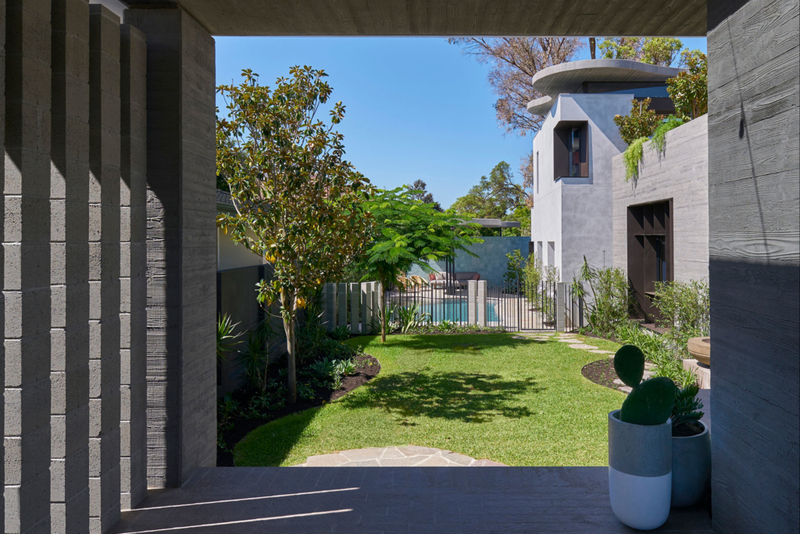 The clients for the Roscommon House have long been fans of modernist architecture and the influence it has had over the ‘Garden Suburbs’ in Perth. The brief called for the predominant material to be grey board finished concrete. Neil Cownie Architects thoroughly tested the moulding technique to create a finished project that is both textural to the hand, and the eye. 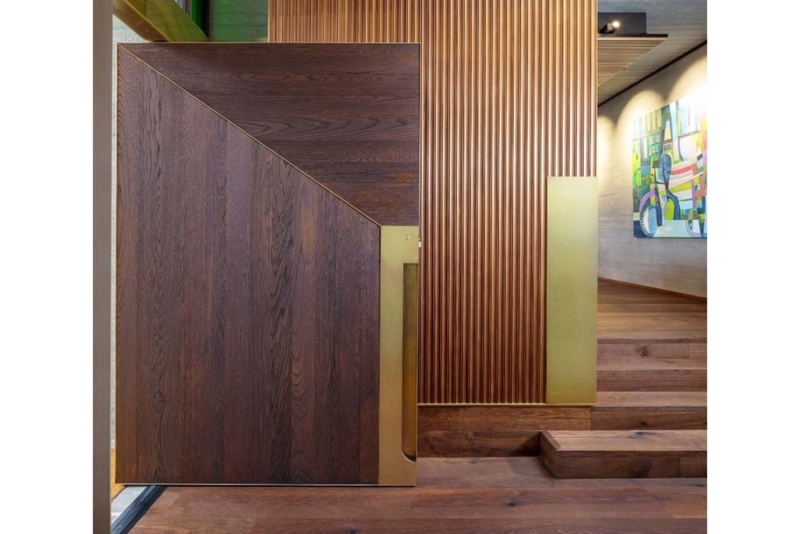 Calibre Consulting provided the engineering on the project, with Abbotsolutely Timber as fabricators of the timber scotia cladding, and Mosman Bay Construction as builders. The big aesthetic gesture that defines the look of the Roscommon House is the board finished concrete. 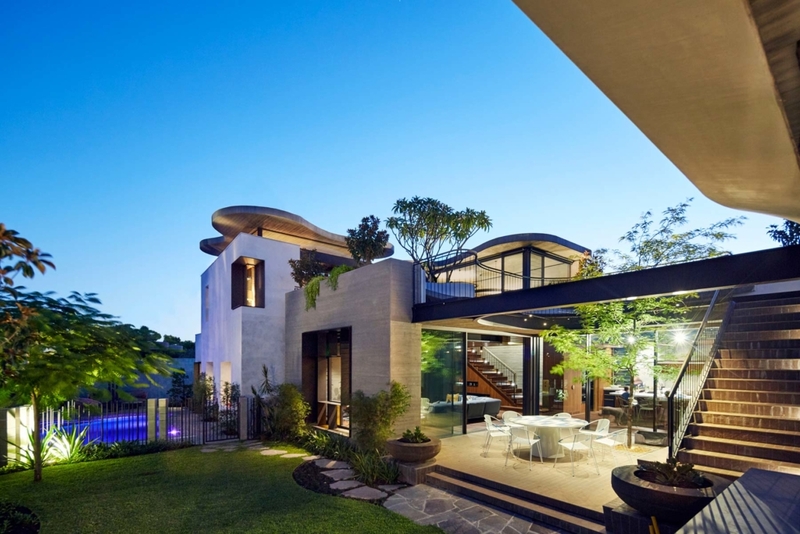 The Floreat area has a history of modernist architecture, and it was important to both client and architect to reference this. Through investigation of different timber boards, a suitable grain pattern was chosen. The boards were sandblasted to enhance the grain exposure, before a mould was formed for the concrete pour. 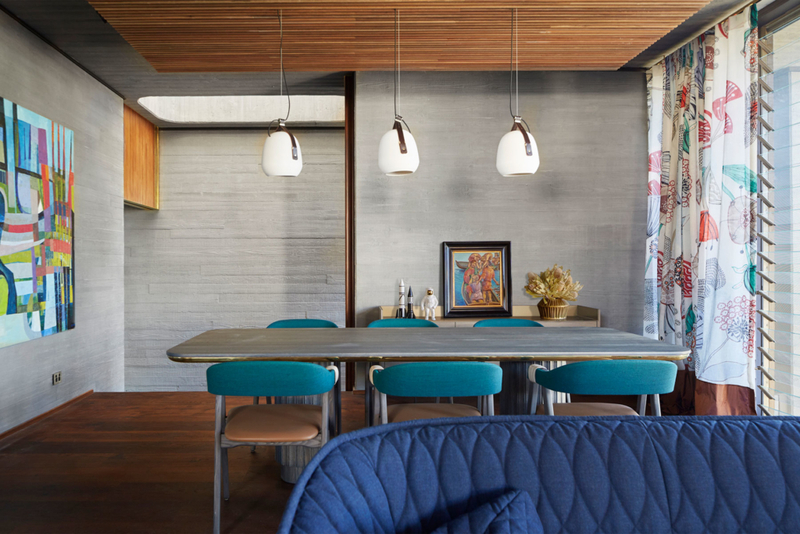 The exposed grain resulted in a highly textured finished to the concrete, providing a rustic but elegant look. 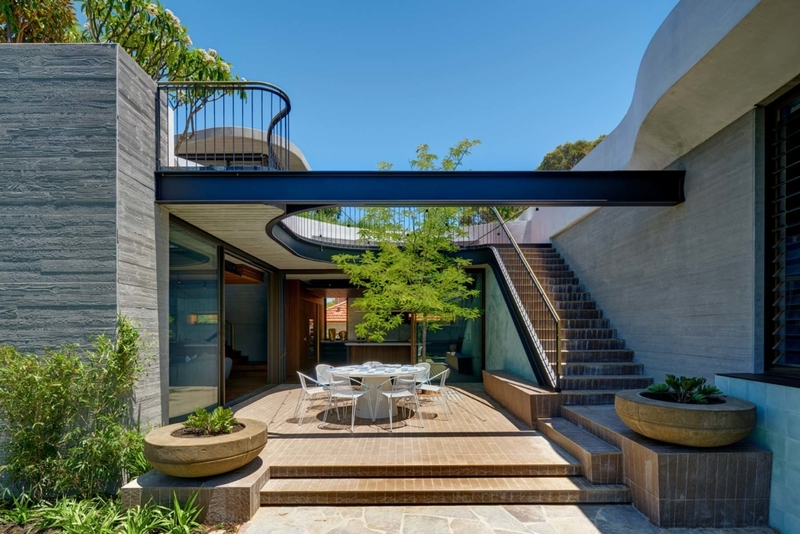 The roof profile is another reference to the city’s heritage, forming a low slung, ‘scooped’ concrete profile, similar to that of the old City Beach SLSC. It is also similar in profile to historic beach kiosks in the area. The board marked concrete continues as a theme from the exterior into the interiors. Given that the structure presents as a largely brutalist inspired concrete structure from the outside, it was important to balance this with a warmth on the inside. Extensive use of timber was the design solution to offset the cold with warmth. Every timber detail throughout the house was tested beforehand, to ensure the highest quality detailing and a suitable balance from the cold exterior. The result is a testament to the versatility of timber when used creatively and uniquely. A big focus of the design was to create a contrasting material palette, both in colour and material. 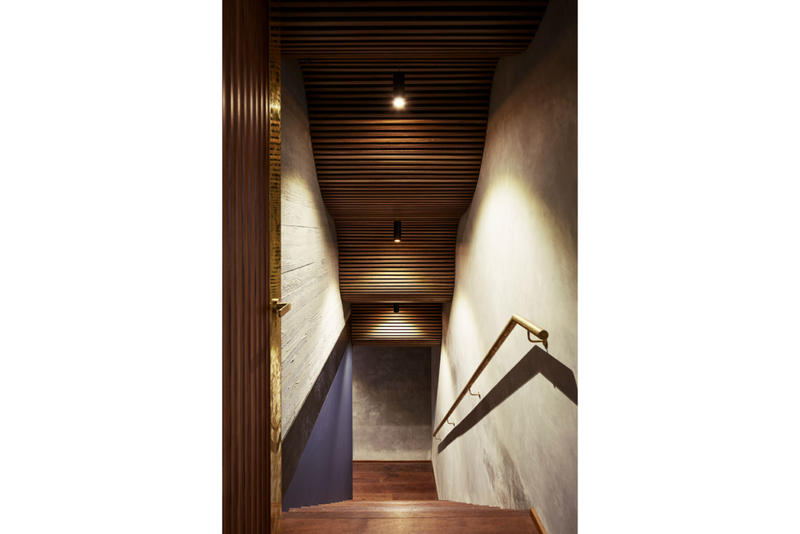 Stone, brass and timber all operate side by side, creating a rich diversity of experiences. 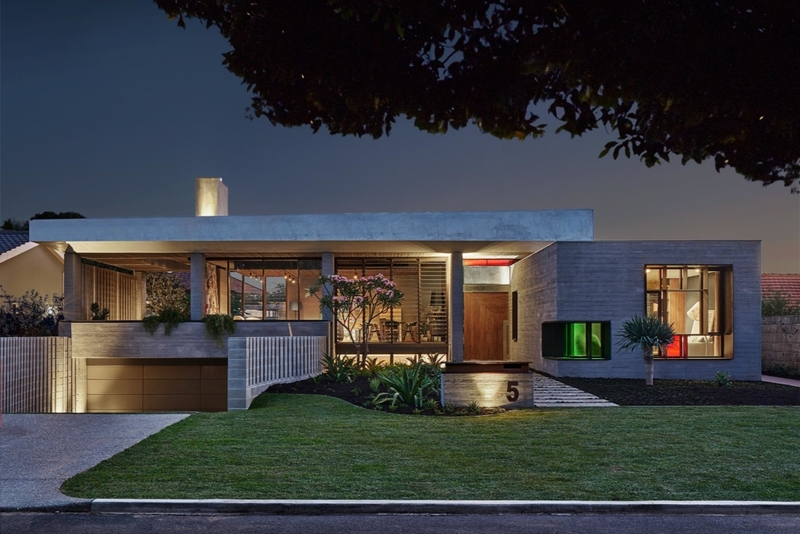 A high thermal mass from the concrete provides excellent energy efficiency throughout. To complement the client’s wishes for a long lasting home, the materials were chosen for their ability to age gracefully. Cownie refers to the ethos of seeking beauty in imperfection. Timber ‘scotia’ battening hides much of the interior concrete formwork, whilst also screening lighting and electrical work. A sculptural display of timber battens forms the underside of the staircase, creating an undulating mass of timber that guides the traveler. A comprehensive lighting plan of mostly recessed LED track lighting provides a low energy but highly versatile lighting arrangement. The major lighting focus is the custom ‘Blade Runner’ pendant light designed by Neil Cownie’s studio. A thermally modified, sustainably harvested timber was provided by the supplier, ensuring low maintenance and maximum performance in its setting. The material was used mainly as flooring, with dark tones and wider sizes chosen to create a warmer aesthetic. The ‘House of Cupboards’ makes extensive use of Australian hardwoods in an affordable (under $200,000) ‘flat-pack’ housing solution.